The June 2016 merger between chemical giants Dow and DuPont is back in the news now that DowDuPont has announced plans to split into three separate entities by June of next year. Plans are in place to create a materials-science concern called Dow Holdings and a new agriculture products corporation called Corteva. That leaves good old DuPont, a household brand name that reaches all the way back to 1802, when French chemist E.I. du Pont began manufacturing gunpowder in Wilmington, Del. Starting in 2019, DuPont will be a specialty products company and include Tyvek, a high-density polyethylene fiber found in everything from business mailers to house insulation, and Great Stuff sealing and insulating foam. 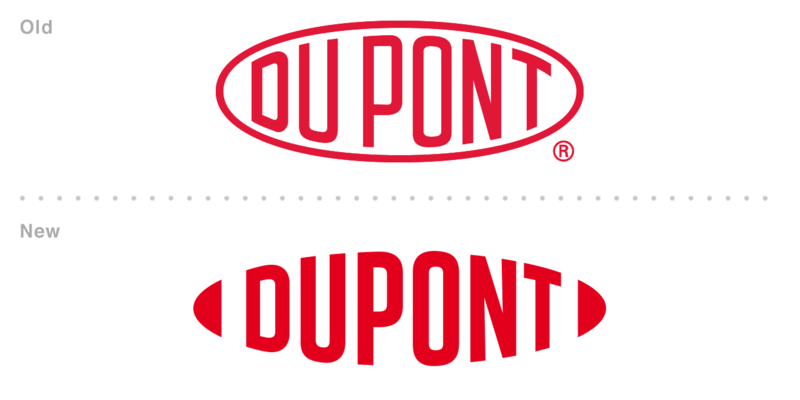 It follows that the new DuPont needs a new logo, too, which left both the brand and its creative partners at Lippincott with the delicate task of updating and modifying one that hadn’t been changed since 1909. Here’s a before-and-after view of the logo, and some of the thinking behind the changes. The border is gone, but the new logo echoes the original by inscribing the letters within an oval. “We preserved a lot of the legacy value in that shape,” said chief communications officer Barbara Pandos.